These faith-based books can inspire you to keep your New Year’s resolution. One year, before my sweet little ones were born, my New Year’s resolution was to read 52 books. That didn’t happen, but I think I made it to 30. My reading time has tanked since I became a mommy. I still try to read a little every day though, because reading relaxes me, and books inspire me to learn and grow. I’m doing a one word resolution again this year (here’s my post about it but Spoiler Alert- my word is habits 🙂 ), and I want to read three of Charlotte Mason’s volumes to help me with this resolution. Along those lines, I wanted to make a list of books that would help keep up other resolutions. This is a list of faith-based books that I have read and loved. If you aren’t as terse with your resolutions, don’t worry, I think you’ll still enjoy these books! I’m reading this book with a Bible Study, and we are all really enjoying it. The author, Shauna Niequist, writes about her journey from a fast-paced, unenjoyable life spent chasing self-worth, to one rooted in God’s love for her. She had filled her life with yeses, which meant saying no to the family that needed her. The book explains her physical, emotional, and spiritual growth in this area. We don’t need to do everything perfectly, we just need to be there for our little ones. It’s about rejecting the myth that every day is a new opportunity to prove our worth, and about the truth that our worth is inherent, given by God, not earned by our hustling. My anxiety sky-rocketed after my babies were born. Recently, I went through this Bible study with a small group of women in all different seasons of life. We appreciated that the author addresses anxiety through different angles that we had never considered. She has thoughtful questions that led us to great discussions, but you could definitely go through it alone, too. I read this book a few years ago, but its beautiful ideas still strike me. Ann Voskamp talked about some hard incidents in her life that led her to become anxious and living on empty. She started making a list of 1000 things that she was thankful for. Her attention to gratefulness allowed her to focus on the good and beautiful things that she had been blessed with, rather than the “what ifs” in the future. She describes the mundane so beautifully that I have learned to stop and pay attention to the beautiful gifts around me. Each picture in this book has scripture or inspirational ideas to go with it. It reads almost like a devotional, and gives you time to sit in silence and reflect. Sometimes I think Lysa Terkeurst is my soul sister, because she just gets me. First she wrote Made to Crave, which spoke to me right where I was in that season. Then she wrote Unglued: Making Wise Choices in the Midst of Raw Emotions , which I really needed as a newly wed (and should read again as a mama of a threenager!) And a little tangent about Unglued: it would be a great read if you are hoping to tame your anger in the New Year, but I didn’t think it was fair to put THREE Lysa TerKeurst books in my roundup! Now, she wrote this amazing book, Uninvited. The first word of the title describes how I’ve felt in friendships since my first child was born, and if I’m being honest, probably long before that. I just started reading this book, but it is speaking to me so much already! So what 3 Books are you reading for Habits? This is something I am working on for me and for my kids. I’m hoping to finish Charlotte Mason’s series (I have 3 left!). 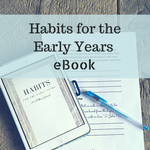 I’d love to learn about other books about habit formation! I love this list. I think the last book Uninvited might hit home for me right now too. Becoming a momma when most of your friends aren’t really cam make you feel just that…uninvited. I think I will have to check this one out! Love this and I am pinning it so I can go through more carefully later. I love to read so does the rest of my family, this will be great. Thank you again you just helped me complete my Christmas list. Also your blog name is adorable!